Digital transformation is all about change - changing technology, changing how the organization operates, and changing the overall business strategy. Therefore, the key to your digital transformation journey lies in unlocking the catalyst for these changes in your business. 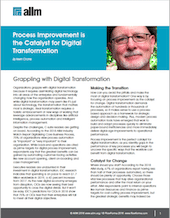 Many are turning to process improvement as this catalyst and it's easy to see why. It's no secret that digital transformation demands the automation of hundreds or thousands of processes, so it makes sense to use a process-based approach as a framework for strategic design and decision-making. Check it out and learn what process improvement can do for you.